The Asian pear (Pyrus pyrifolia) is an edible variety of pear originally from East Asia. The fruit is an atypical pear with a particular appearance and distinct texture and taste. It looks more like an apple than a pear and is particularly grainy, but sweet and juicy. One of the quirks of this fruit is the fact that it’s still firm when ripe which may confuse some consumers as to when it’s ready to eat. The fact that Asian pears provide modest nutrition at best doesn’t stop them from helping with blood sugar control in diabetes, constipation relief, better transit or delivering minor benefits for high blood pressure and cholesterol. Alternative names include: Korean/Japanese/Taiwanese/Chinese pear, Nashi Asian pear, apple pear (because of its resemblance to apples) and sand pear (because of its particularly gritty texture). In its native area, the fruit is sometimes called by the names of its cultivars such as Chojuro, Kosui, Hosui, Nijisseiki, Niitaka etc. To Westerners, the most popular names for the fruit are Asian and Korean pear. However, composite names that include the name of the cultivar, area of origin or the generic name or sometimes color of the fruit are also common. Examples: Raja Asian pear, Chojuro Korean pear, Yoinashi Asian pear, Chojuro pear, Kosui pear, Kosui green. One of the biggest benefits of Asian pears is their low glycemic index score of only 26 which recommends them for consumption with diabetes. If you have diabetes or pre-diabetes/hyperglycemia, then know you can eat Asian pears in moderation because they should not raise your blood sugar excessively or too fast. Other than this, the health effects of Asian pears are modest at most. Despite its popularity, the fruit is low in essential nutrients, with a average of 1-2% of RDI’s (recommended daily intakes) for most vitamins and minerals per 100 g. It does however provide varied nutrition and contains vitamins B1, B2, B3, B5, B6, B9, choline, vitamins C, E and K, magnesium, manganese, phosphorus and potassium. What do Asian pears look like? Asian pears tend to be large at maturity, although smaller varieties also exist. The fruit are notable for their rounded, apple-like shape, hence their alternative name ‘apple pear’. But while most cultivars are uniformly round, some are more flattened at the end opposite to the stem, quite stumpy-looking, or even oval or more typical – round at the base and tapering towards the top. 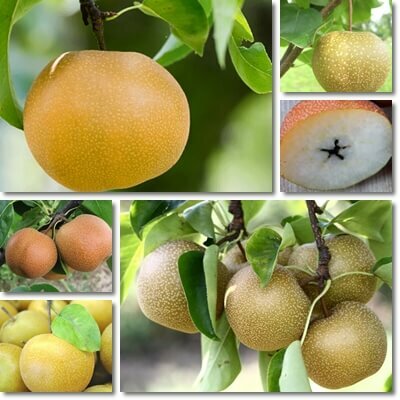 Probably the most unmistakable characteristic of Asian pears is their skin appearance: yellow-brown (at times a brown with an orange-reddish tinge) or yellow-green skin speckled with small, light-colored spots or dots. At a closer inspection, the light-colored spots or dots are roundish or irregular and appear grey or cream in color. These discolorations are called lenticels and are essentially pores on the skin of the fruit allowing them to exchange gas and water with the surrounding environment. Asian pears usually have a smooth skin, but they can also showcase russetting, essentially areas of thicker skin. For the most part, lenticels (speckles of discolored skin) are a defining characteristic of many Asian pear varieties. The pulp is creamy white in color with brown-black seeds. Overall, the fruit tends to look the same throughout cultivars, despite minor differences, and should be easy to recognize. What do Asian pears taste like? Asian pears taste sweet and aromatic, similar to European varieties. Different flavor notes may be noticed in various cultivars. Some cultivars are sweeter, with a more pregnant fruity taste; some are slightly tangy, just barely acidic whilst others have particular aromas such as faint taffy or toffee flavors. Asian pears have a crisp texture, similar to apples so don’t wait around for them to get soft before eating them because, well, they won’t. They are however juicier with an average of 4 more g of water per 100 g compared to European varieties which makes them taste more refreshing. Their texture is grainy, slightly rougher than that of European varieties. Do you eat the skin on an Asian pear? Yes, you actually eat Asian pears with skin, although this is only recommended if the fruit comes from organic agriculture. Compared to organic, conventional agriculture may result in pesticide residues in the skin which is detrimental to your health long-term. The biggest benefit of eating fruits with skin is you get important amounts of dietary fiber, essentially indigestible plant material that helps relieve constipation, regulate transit, control blood sugar and lowers cholesterol levels. How do you know when Asian pears are ripe? Asian or Korean or Japanese or Chinese pears are different from European ones in the sense that they are firm and apparently tough even when perfectly ripe and ready to eat. If the fruit is soft or mushy, then it’s overripe. What you need to know is that the skin ripens to a golden brown, bronze or sandy color in some varieties or yellow-green in others. If you can’t really tell by color, know that the skin thins in the ripe fruit, so this could help you determine if it’s ripe enough to eat. The color of the ripe pear should be the same all over (not including russetting, areas of thicker skin). Blemishes mean it’s overripe or even gone bad. It helps to know what type of Asian pear it is you are eating or getting and judge its ripeness based on the general maturation timeline of the specific cultivar. Some cultivars ripen as early as mid-July, others as late as October. Lastly, you know when Asian pears are ripe by tasting them. If the skin is thin, the pulp firm but juicy and the taste sweet with fruity flavors and a pleasant fragrant smell, then you’ve got yourself a good pear to eat. Don’t try to squeeze the fruit to tell if it’s ripe – it’s firm even when perfectly ripe and ready to eat. Squeezing, even if gentle, will only damage the fruit and it will store poorly after that. As mentioned above, Asian pears are overall low in essential vitamins and minerals so their health benefits are limited. However, with a low glycemic index score of only 26, Asian pears have a minimal impact on blood sugar which makes them good to eat with diabetes, in reasonable amounts of course. The good amounts of dietary fiber in the fruit promote better blood sugar control. Fiber further helps regulate transit and relieve constipation naturally as well as contributes towards healthier blood cholesterol levels, reducing LDL (bad) cholesterol. Asian pears are high in water, low in calories, almost fat-free, nutrition facts which recommend them for consumption for the purpose of weight control. Small amounts of vitamin C and vitamin K hold minor benefits for skin, immunity, wound healing, inflammation and blood coagulation. Lastly, Asian pears are essentially sodium-free and have some potassium and magnesium which means their regular consumption modestly benefits blood pressure.